The IGKT logo as a silver pendant. A story of bow ties in the Morning Sentinel. Ties and Indian youth and fashion on Express Buzz. Lifehacker talks neck ties and features the Shelby knot with an instructional video. Tayyar of Lebanon also talks about the Shelby or Pratt knot with an illustrated how to. Lifehacker shows you how to tie the Merovingian or Ediety knot with a video. Tayyar of Lebanon has another illustrated how to for the Windsor knot. A necktie aficionado tells the story that led to his tie company. The Examiner explains how to wear a scarf with style. The Examiner talks about the history of the scarf. Melody blogs about a small gallery of Chinese button knots. How to tie the knot to end all knots... or at least the knot to tie on the end of your shoe laces so that you don't have to tie your shoe laces anymore. Here it is, the Eastland knot. The Irish Times gives a travelogue of Kerala on the southwestern tip of India. They seemed particularly taken with the dhoti, the male equivalent of the sari with some similarity to sarongs, worn by the local men. As with saris there are a variety of ways to wear the dhoti and some of them involve knots along with the folding and tucking. Timberland has made a boot covered in Chinese characters with bright Chinese red laces. Or have they? I tried to find more information but no luck. It could be a third party modified product, or it could be a product manufactured for the Asian market with publicity materials not in English. Someone who actually wants the boot can try harder than I did to find more information. 8) I do wonder if the boots come with the knot or if the knot was just there for photographic flavour, certainly you wouldn't wear the boots with the knot attached. Mathaba of Malaysia speaks of high fashion's appropriation of the traditional dress of ethnic minorites. A practice that is encouraged or frowned upon depending on which anthropologist you ask. Case in point, John Galliano a Christian Dior designer apparently used Chinese knots in his works. Apparently he used knots and tassels on his clothing. This fact is often referred to, but as for pictures, I could only find this bag. 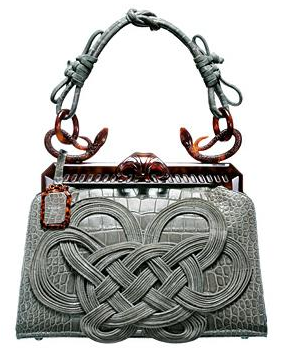 Considering the amount of knotwork involved in this bag, I'm pretty keen to see some of the clothing, but maybe someone more familiar with fashion can suss out more pictures (perhaps by scrolling through or waiting through the slideshows on this fashion site with historical archives). cat like dog blogs about a Chinese knot handbag, but to me it looks more like cord couched in a complicated pattern with no actual knots involved. You be the judge.